« Culture wars in Ocean Grove: What will the relationship become involving the residents of OG and the CMA? 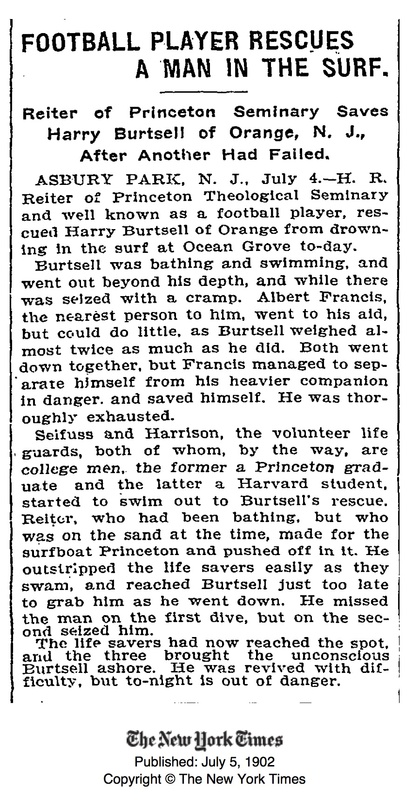 George Beecroft of Ocean Grove, citizen reporter, shared this New York Times news item from 112 years ago along with the Wikipedia article about the hero—H.R. Reiter. 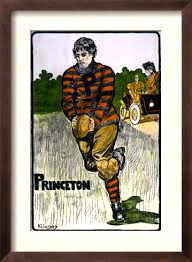 Princeton football player c. 1902. Howard Roland “Bosey” Reiter (c. 1871 – 1957) was an All-American football player, coach and athletic director. He was selected for the 1899 college All-America team and played professional football as a player coach for the Philadelphia Athletics of the first National Football League in 1902. He was the head football coach at Wesleyan University from 1903–1909 and at Lehigh University from 1910–1911. Reiter has been credited by some with the development of the overhand spiral forward pass, which he claimed to have developed while playing for the Athletics in 1902. Sounds like there was a little Hail Mary involved here too…….